Cut the melon in half and carefully remove the flesh and cut into small pieces. 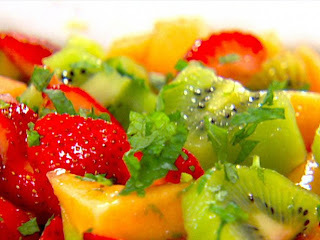 Mix the melon with the rest of the cut fruit, the almonds and the grapes and fill the melon skins with this mixture. On a low heat, warm the wine with the honey mixing well. Pour this mixture over the fruit. Before serving, the fruit should be put in the refridgerator for an hour.